Mining coal and burning it in power stations uses large amounts of water, and pollutes even more water. It imposes massive but uncounted costs on society and particularly on poor people who live in the coal regions. 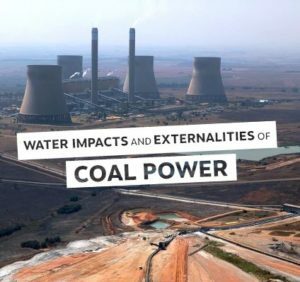 A new report from the Life After Coal campaign calls for these costs to our water resources to be accounted for in the Integrated Resource Plan (IRP) – South Africa’s plan for the future electricity system. The Life After Coal campaign partners Centre for Environmental Rights, groundWork and Earthlife Africa, together with Greenpeace Africa, have indicated that they will have no option but to challenge an IRP that fails to adequately take the costs of coal into account, in court. The report, entitled Water Impacts and Externalities of Coal Power, was compiled by the Life After Coal campaign from a wide range of existing research on the cost of the impacts of coal mining and burning on water resources. Coal power requires enormous volumes of water. Coal mining and power generation together consume 5% of South Africa’s water. At local level in the Upper Olifants catchment, power generation accounts for 37% of water use. The external water costs of Eskom’s new Kusile power station are between R0.95 and R1.86 per kWh, according to a Greenpeace study. The opportunity cost (or scarcity value) of the water used for Kusile will be between R6 billion and R12 billion each year and the damage cost imposed on other water users from sulphate pollution will be between R4.5 million and R7.7 million annually. The electricity sector pays far less for water (approximately R3.40/m3) than the average household (approximately R8/m3). This means there is no incentive to prioritise water-efficient supply options. In contrast, properly valuing water would justify a rapid transition to water-efficient renewable energy. Our scarce water resources are impacted throughout the coal life-cycle. This includes direct impacts on water quality during coal mining; impacts of air pollutants on water resources and coal ash contamination of groundwater. Acid-mine drainage has the most severe impact, with treatment estimated to cost around 0.38/kWh (ZAR 2009). Apart from future water treatment costs, the historical impacts of coal mining will require treatment and associated costs for decades to come. South Africa has close to 6000 recorded derelict and ownerless mines. It is estimated that the closure of these mines, including long-term treatment of acid-mine drainage, would cost up to R60 billion. Including water supply and infrastructure costs into energy modelling could result in a 75% reduction in water intensity of the power sector by 2050. Renewable energy technologies use far less water. A decarbonised energy future would require four times less water, by 2050, than the draft IRP’s “Base Case” which relies heavily on coal and nuclear. A decarbonised future would also cost less and create up to 331 000 jobs in the energy sector by 2050 according to research by the Council for Scientific and Industrial Research. The negative externalities of coal power disproportionately affect marginalised communities living near coal mines and power stations. This is contrary to both section 27 of our Constitution, which provides that everyone has the basic human right of access to sufficient and safe water and section 24, which provides that everyone has the right to an environment that is not harmful to their health or well-being. The report makes clear that it is critical that the new draft of the IRP, which Energy Minister Jeff Radebe says will be published shortly, considers the full range of water-related externalities and impacts in determining and costing South Africa’s future electricity supply mix. If not, the Life After Coal campaign, together with Greenpeace Africa, have indicated that they will have no option but to challenge such a failure in court. Life After Coal, together with Greenpeace Africa, has previously called for a set of basic minimum principles to be met by the IRP. One of these is that the IRP must take full account of externalised costs. Makoma Lekalakala, director of Earthlife Africa, says: “Excluding these costs results in the misrepresentation of the costs of coal-fired power generation. These costs do not go away. They are borne by the environment, by society in general and especially by poor communities. Conversely, including these costs would justify a rapid shift from coal to water-efficient renewable energy. This transition is essential and urgent given South Africa’s water crisis. It is equally urgent that this is planned as a just transition that contributes creating a more equal society in which everyone has a place including workers who are currently employed in the coal sector.” The Life After Coal Campaign continues to call for a least cost IRP that meets the minimum requirements and is in the best interest of all South Africans. Download a brochure that provides a summary of the report here. WWF-SA. 2011. Coal and Water Futures in South Africa The case for protecting headwaters in the Enkangala grasslands. Cape Town: WWF-SA. World Bank. 2017. Modelling the water-energy nexus: How do water constraints affect energy planning in South Africa? Washington D.C: World Bank Group. Council for Scientific and Industrial Research (CSIR). 2017. Formal comments on the Integrated Resource Plan (IRP) Updates Assumptions, Base Case and Observations 20170331-CSIR-EC-ESPO-REP-DOE-1.1A Rev 1.1. Pretoria: CSIR.